Insurance companies and lenders don't refuse to give you referrals because they don’t trust your ability to mitigate risk. Title insurance companies don't take your coverage away, making it impossible for you to practice real estate law. 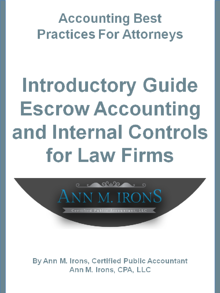 You don't alienate clients because of the effect your escrow accounting has on their credit score. You don't subject yourself to the risk of having to pay severe penalties and interest. You don't open yourself up to the loss of funds as a result of fraud, theft and embezzlement. By registering to download this guide, you agree to let us send you no more than one email per month with tips about how to manage the business side of your law firm.